Nintendo's take on the Williams arcade title Joust. The aim is to burst the balloons of the enemy Balloon Fighters to clear each stage. 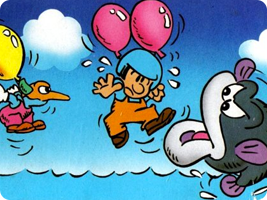 The games also come with Balloon Trip mode, which became the inspiration for later games, including Balloon Kid, which took the mechanics of Balloon Trip and turned it into a full adventure game.